helped address student learning needs at particular stages of their program. relevant learning activities for Year 2 (junior) dental students. V. J. SKINNER ET AL. and friends who elect to attend the student clinic as patients. tients in the dental hospital? and 2 to Year 3? commonly experience during patient encounters in the ADH. 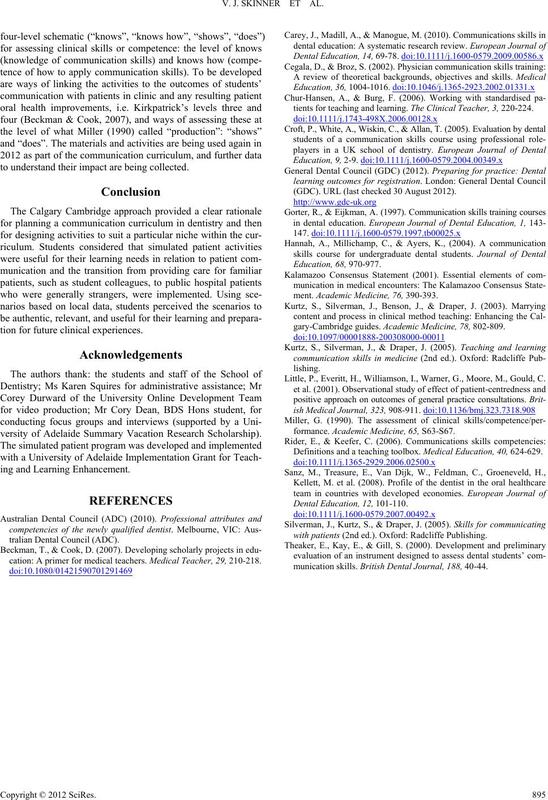 Patient care provided by students throughout the Adelaide dental program. ote: a.ADH: Adelaide Dental Hospital (patients are eligible for publicly funded dental services via the South Australian Dental Service). 5 BDS students in the ADH. Sixteen clinic tutors participated. Each interview took 20 - 30 minutes and was audio-recorded. that could be used for scripting scenarios. digital video file of their interaction with the simulated patient). relevance, usefulness, and impact are reported here. “Building confidence”; and “Defusing situations”. dence in their student clinician so that treatment can commence. at the student clinician. This is also to enable care to proceed. trates the process and content skills embedded in each scenario. 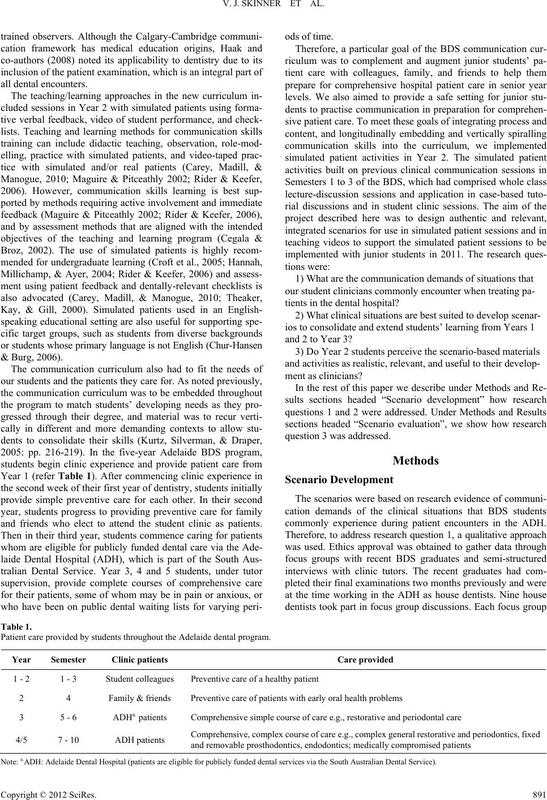 ability and confidence for clinical communication with patients. Summary of the title/core goal and the patient and student roles in each of the three scenarios. Summary of the process and content s k i lls embedded in each of the three scenarios. 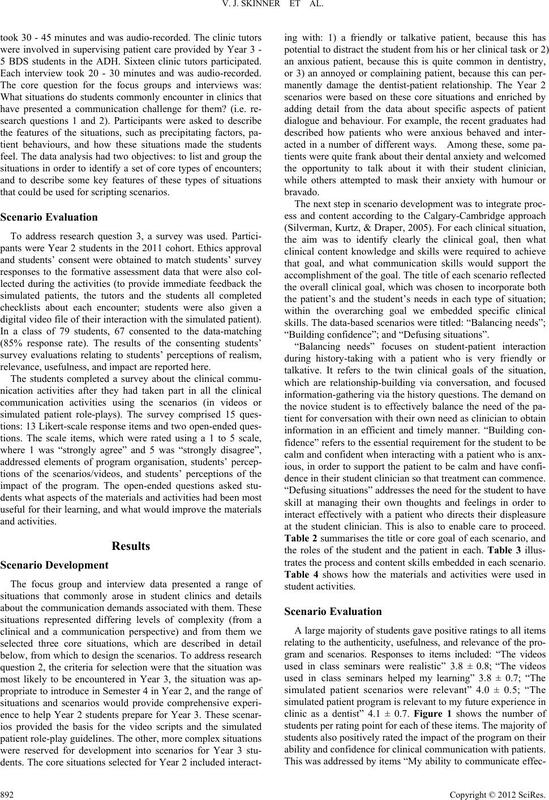 Student activities using the scenar i o- b a s e d v i de o s a n d s imulated patient sessions: outl i n e p r o v i d e d t o s t u d e n t s .
Students’ ratings of realism, usefulnes s, and relevance. Students’ ratings of their ability and confidence. videos used as a basis for class discussions in the seminars. 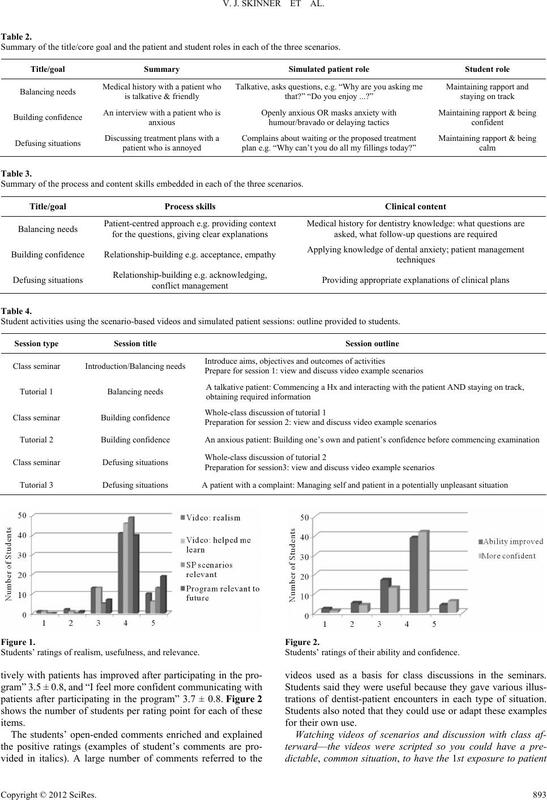 trations of dentist-patient encounters in each type of situation. can learn good phrases & things to avoid. definitely prepares us for further years. Being able to make mistakes AND learn from them. tice interacting with patients in these situations. gestions of possible ways of managing patient. pares us for clinical situations. a good thing to do before seeing real patients. terms of patient expectations and reactions. Other positive comments related to the small group format. it was useful to observe and learn from colleagues’ interactions. ing to complement other learning activities. 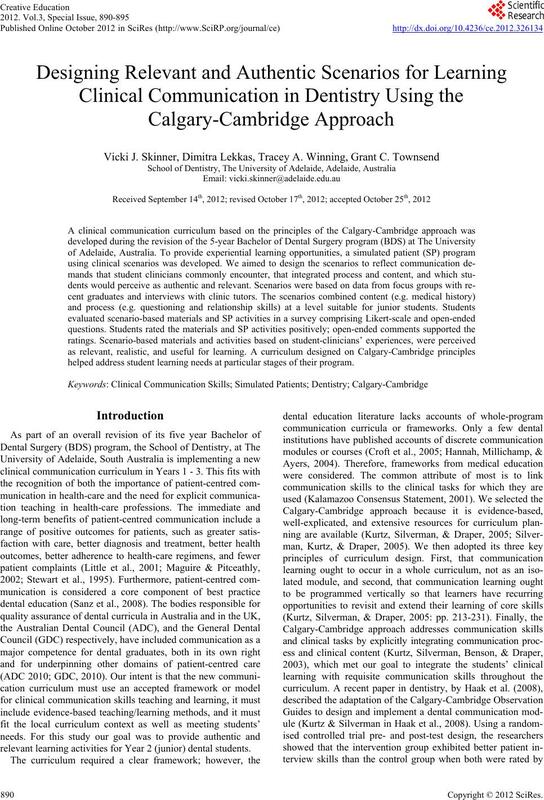 UK and US dental schools (Carey, Madill, & Manogue, 2010). Millichamp, & Ayers, 2004; Gorter & Eijkman, 1997). vey addresses the reaction and students’ perceptions of learning. to understand their im pa c t are being collected. tion for future clinical experiences. versity of Adelaide Summary Vacation Research Scholarship). tralian Dental Council ( A D C). cation: A primer for medical teachers. Medical Teacher, 29, 210-218.
tients for teaching and learning. The Clinical Teacher, 3, 220-224. (GDC). URL (last checked 30 August 2012). ment. Academic Medicine, 76, 390-393.
gary-Cambridge guides. Academic Medicine, 78, 802-809. Little, P., Everitt, H., Williamson, I., Warner, G., Moore, M., Gould, C.
formance. Academic Medicine, 6 5, S63-S67. Definitions and a teaching toolbox. Medical Education, 40, 624-629.
with patients (2nd ed.) . Oxford: Radcliffe Publishing. munication skills. British Dent al Jo ur na l , 18 8 , 40-44.